Reading Pointillism (2017) felt like returning to Heaney. With Human Chain, his last collection, the great Irish poet moved away from simple nostalgia to doing the Poet’s work of memorialization. You and I remember, the Poet memorializes; she gives semblance of meaning to the lost and forgotten; for her poetry becomes a form of storytelling. For Naz, memory is the only currency she has (The United States of Amnesia); she uses verse to navigate through the many histories and languages which claim her, the many stories which are hers and mine, the many inheritances which weigh us down. To be a South Asian, an exile, a woman—Naz’s project with Pointillism is to articulate the liminality of identity, and what it means to inhabit the hyphen. With Pointillism, Naz attempts her own form of historical revisionism; she looks at South Asian culture as a shared heritage, a sacred ground where languages overlap and blur, where each wound leaves you with a brand, new mouth (Chappan Churri). … but now, there are no masters, ji. Sophia Naz traces the birthing and dying of languages, their continual borrowings, the sameness in their myriad differences. 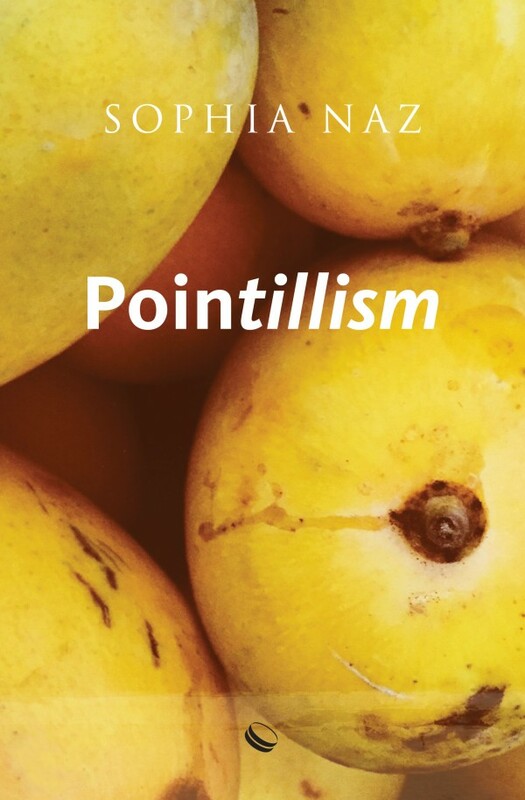 pointillism refers to a mapping of disparate “points” which could be geographical, temporal or emotional markers. It speaks to the ability of language to create compelling cartographies from these seemingly unconnected dots. For Naz, therefore, the construction of personal cartographies out of the cacophony of nationalist narratives involves walking the tightrope of languages, of creating a personal lexicon which borrows from disparate cultural bloodlines. Her speaker therefore seems sometimes unrooted; a consciousness that has somehow escaped spatiotemporality, that has outgrown a national and cultural identity. She traces the birthing and dying of languages, their continual borrowings, the sameness in their myriad differences. Gullet is a concavity between two saw-teeth. Late Middle English from Old French goulet, from Latin gula, from Proto-Indo-European gala as in gullible. Somebody had swallowed. Book cover courtesy Copper Coin, India. I once tried to self-teach myself Spanish, and found the Spanish word for shirt, camisa, oddly sounding similar to the Urdu qameez. Something about that discovery made me euphoric. In my mind, I traced myself back to a condemned witch in the midst of the Spanish Inquisition; I imagined a secret hidden ancestry of which only I knew; language became a way for circumambulating the graveyards of endless possibilities (Tap Routes). Reading Pointillism, I understand “what it means to come // back take a bite out //of your own lost history” (The Gulabi Guavas of Allahabad) or histories that give us the shape of our bones. Naz’s speaker in Pointillism comes from cultural, historical and linguistic intersections, and speaks, or rather yawps from the barbaric rooftops of its many worlds to the mess inside all of us. It therefore seems rather apt for Naz to use the prose poem which is the perfect form for her project of threading multiplicities and juxtapositions. Some of her longer pieces are written in the form of a dialogue with an imagined reader, an elusive and absent you. Her verse imagines a community, or at least a solitary reader; it presumes and demands participation as it remembers an oral culture when poetry or the recitation of it was part of communal togetherness. Developing a metalanguage that transcends divides is crucial to Naz’s endeavor with Pointillism. This absent you is also the one left behind during the partition of India and Pakistan. Several of her poems lament the tolling of the “martial music in the mindless key of jingoism” (Poem for a Missing Man). And, thus, developing a metalanguage that transcends divides is crucial to Naz’s endeavor with Pointillism. She sees “poetry as holding a magic power to both evoke and transcend linear time and perceived reality”, as well as the monoliths of language and culture. To be a citizen of the world might entail a certain kind of homelessness, but it also brings with it a different kind of communal belonging, one which is larger, more diverse, more benevolent. I’ve recognized myself in Naz’s many poems, I recognize the cotton and pause which makes me too (Pecking Order), I share her discontent over barriers and limitations, and the Joycean desire to fly past the many nets flung at me. Her work seems timely yet I recognize the Heaneyesque human chain which had always held us together, which had always been the subject of the Poet. *Papercuts published two of Sophia Naz’s poems from Pointillism in its Vol. 17 “Appetite”. Her book is out with Copper Coin India and can be ordered online from Amazon and Copper Coin. Momina Masood is a poetry editor for Papercuts magazine. This entry was posted in Book Reviews, South Asian Writing and tagged Copper Coin, poetry, Pointillism, Sophia Naz, south asian writing. Bookmark the permalink.